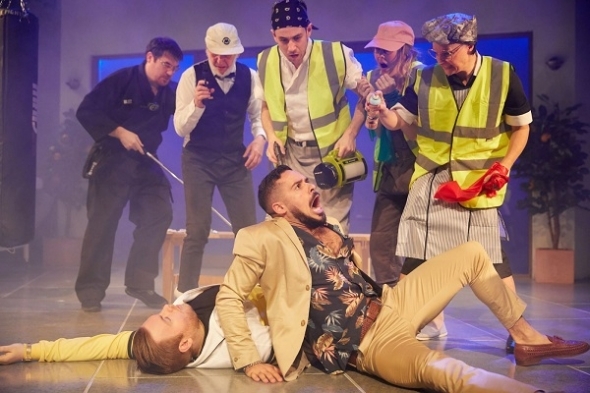 CURRENTLY playing the dastardly ‘Borachio’ alongside TV ‘Bake-off’ star Mel Giedroyc in a contemporary production of Shakesepeare’s ‘Much Ado About Nothing’ is Nicholas Prasad. It makes quite the contrast for him – he was last in the star spotlight with ‘Miss Meena and the Masala Queens’ last summer. Prasad played one of the lovable drag artists who are being brought back to the life for the British Asian Festival (you can read about that here). This version of Much Ado is set in modern day Sicily and plays on the mafia element. It’s easier to accept loose talk can have very dangerous consequences in this environment. “This is in the heartland of the Cosa Nostra and a world still governed by strict codes of honour, family, loyalty and fidelity. The play is part of the Kingston (in Surrey) Rose Theatre celebrating 10 years and this production closes next Sunday evening (May 6) having opened on April 13. As well as being discernibly set in modern day Sicily, all the action takes places in a luxury spa, and for those most drawn to the play’s comedy and language play, Prasad is reassuring. In the play, there are two distinct sides – there is Beatrice (Mel Giedroyc) and Hero (Kate Lamb) and Benedick (John Hopkins) and Claudio (Calam Lynch). Initially, Hero and Claudio enjoy a traditional courtship and look set to get married, while Benedick and Beatrice, both older and somewhat opposed to the institution of marriage and each other, skirmish and verbally duel, until a vicious rumour threatens to upset everything. There isn’t any ethnic component to Borachio in this play. “It’s colour blind casting, and it’s easy to suspend belief in a contemporary production of Shakespeare,” he explained. There’s a bit of modern music too – with Prasad taking up the saxophone. A professional actor for around six years, he’s had stints with the Royal Shakespeare Company (RSC) and the bulk of his work has been in the theatre – in ‘Ross’ at the Chichester Festival Theatre and ‘A Mad World My Masters’ at the Barbican in London and staged by the RSC. He trained at the London academy of music and dramatic art (LAMDA). He said he likes the variety and if he feels he is doing a lot of one thing, he tries to do something else, but likes to keep things balanced. His family – father, of Indian origin and mother, English, are both involved in film and the arts, and never dissuaded him from life as a thespian. A bit like a Mafia stakeout with a TV ‘Bake-off’ star caught in the very middle of it. ‘Much Ado About Nothing’ at the Rose Theatre, Kingston, 24-26 High Street, Kingston KT1 1HL. Until May 5 7.30pm. Check times Tuesday-Friday. There are special deals for under 26s.